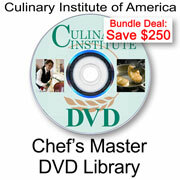 SAVE $$$ Developed by the world-renowned Culinary Institute of America (CIA), this master library of chef training videos are grouped in a specially priced bundle of 19 DVDs and 2 CDs. Titles in the bundle include: Culinary Knife Series, the Basic Kitchen Preparation Series, the Garde Manger Series and many more. All DVDs use Region Code 0 so they may be played on DVD players and PCs anywhere in the world. 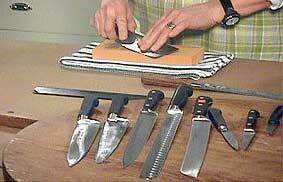 This DVD demonstrates how to choose the right knife for the job and how to use it correctly. Designed for both professional and amateur chefs, beginners or those wanting to brush up on their skills, the easy-to-follow instructions cover all of the basic knife cuts and techniques, offering an excellent foundation for building speed and ensuring kitchen safety. This DVD covers the basics of choosing, handling and caring for your knives. Knives are among a chef's most prized possessions and treating them with respect and care helps prolong their life and ensure safety and efficiency in the kitchen. The ability to select, handle and care for a knife is one of the hallmarks of a professional and the knives you use will become as important to you as your fingers. Vegetable Preparations - dicing and chopping, Garlic and shallot roasting, techniques using tomatoes, mushrooms, peppers, chilies, herbs, artichokes, asparagus, and much more! Flavor Enhancing - clarifying butter, mirepoix and matignon, bouquet garni and sachet d'epices brines, barbeque, marinades, and dry rubs. Ingredient Preparation and Handling - whipping cream and egg whites, rehydrating beans and fruits, folding, tempering, pan-toasting. 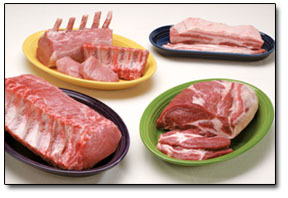 American lamb offers a wide range of culinary possibilities no matter the foodservice venue. This DVD, with an accompanying training manual, will help you to better prepare your students and/or staff on this underutilized protein. The manual includes information on lamb carcass breakdown, nutritional facts, cooking methods, recipes and more. Pork is a popular menu item that is used in breakfast, lunch, entr� and appetizer menus throughout all facets of the foodservice industry. The Pork: Beyond the Chop Foodservice Learning Solutions DVD, with an accompanying training manual, will assist in educating your students or staff on this popular, versatile protein. Learn the detailed methods and creative design concepts for preparing luscious pastries and spectacular sugar and chocolate showpieces that your customers will long remember. This comprehensive series will show you how to fully satisfy your customers' sweet tooth. It's a hands-on session with a top confectioner that will add to your bottom line. In this video, Ewald Notter of the International School of Confectionery Arts demonstrates the techniques for creating spectacular three-dimensional sugar works guaranteed to fascinate customers. In part two, Chef Notter transforms basic confectionery building blocks into dazzling artwork. Explore the techniques and preferred methods for creating common, Swiss-style, and Italian-style meringue. Learn both classic uses of meringue as well as innovative presentations. Gain helpful tips on producing, storing, and evaluating this fundamental component of the professional baker's art. Explore the techniques and basic recipes for these staples of fine pastries. Learn the quality standards for evaluating vanilla sauce and pastry cream. Price menu items and perform yield testing to determine total recipe cost. Establish standard recipes and portion sizes. Assess weight vs. volume, cost per unit, and edible portion quantity. Examine ingredients and equipment needed for lean doughs. Learn the straight-dough mixing method for lean dough. Discover shaping and scoring techniques to produce the best-looking breads and rolls. Learn the essentials of making laminated dough used in puff pastry, Danish, and croissants, including key ingredients and formulas. Discover mixing, rolling, and shaping methods. Find out how to evaluate quality in your finished baked goods. 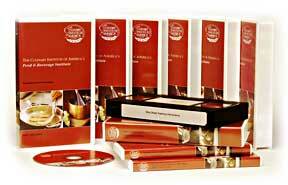 This DVD will give you a solid foundation of knowledge and skills in the critical segment of the culinary arts - sauce making. 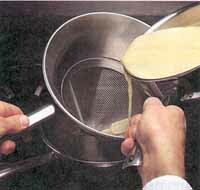 One of the most basic cooking fundamentals is the creation of soups, stocks and sauces. 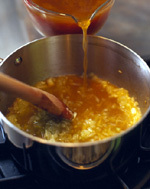 The Basics of Sauce Making contains four sections - one for each group of sauces. 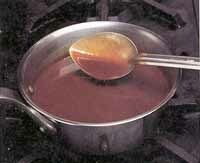 The process for creating espagnole, demi-glace, fond de veau li�, au jus, jus li�, pan gravy and glace de viande. 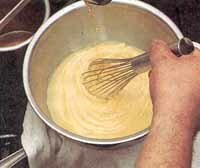 Thickening sauces with a roux or a slurry. The main applications for glace de viande as well as commercial bases. Classic Veloute and b�chamel and some of their contemporary interpretations. Traditional mornay sauce and a low-fat variation. The art of creating classic hollandaise, b�arnaise, beurre blanc, and mayonnaise. 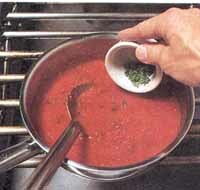 How to prepare classic roux-based, French-style tomato sauces and Italian tomato sauces.